I was never taught that slavery existed in the north. I was taught that it was a southern phenomenon, and this was reinforced by what my maternal grandmother remembered about her family’s past. She knew that before the Civil War, her southern ancestors had owned slaves in South Carolina, Georgia, Mississippi, Louisiana, and she deplored this. In fact, of all my grandmother’s ancestors, I was certain, even proud, that at least her Connecticut and Massachusetts forebears, people from the heart of future Abolitionist territory, were free of contact with the “peculiar institution”. Yet a little digging unearthed a fact of which I had long been ignorant: even people from New England, from the heart of the future Abolitionist movement, owned slaves. As I was to find, my New England ancestors actually owned more slaves than my southern ones, and for a longer period of time, in a chain of enslavement forged a little over sixty years after Columbus “discovered” America in 1492. As my friend Sandra Bridges pointed out to me recently, “It isn’t easy cleaning house, especially one as vast as yours…meeting ghosts good, and not so good….knowing you mirror your ancestors.” She encouraged me to “set the record straight.” I plan to do that in a book that records my journey through records, family history, and time as I paddle against the downward bloodstream of ancestry near and remote. It will be a book that takes a good long look in the mirror of genealogy and names truthfully what it finds there. Many faces are reflected back at me from that mirror, from settings that alter with each passing century yet do not differ in one respect: there are black faces somewhere in the frame, as in the portraits of fashionable folks of two and three centuries ago, for whom a “blackamoor” was a combination of accessory, servant, and pet. (For a penetrating exploration of African children exploited in these portraits, check out Barbara Wells Sarudy’s blog, “It’s About Time”) . There was Benajah Bushnell (1681-1762), a wealthy businessman of Norwich, CT who owned at least two male slaves, Robin and Guy. Bushnell’s wife, Zerviah Leffingwell, came from a Norwich family whose homestead, now a museum, was traditionally the site of seventeenth century slave sales. There was Capt. George Denison of Mystic with his enslaved Native Americans John, “bought of the county”, and Job, “born in this house.” And there was John Griswold of Lyme, with his three African slaves, whose mother-in-law, Mary deWolfe, belonged to a family which would produce the most prolific slave-trading dynasty in American history, and right in New England’s backyard, Providence, RI. John Griswold’s son, Rev. George Griswold, married Hannah Lynde, daughter of Nathaniel Lynde (1659-1729) of Old Saybrook. Nathaniel was the first treasurer of what became Yale University and donor of the land on which the original school stood. Nathaniel owned four slaves—Rose, Cesar, Juba and Nero, a large number of household slaves for the time. His son, Hannah’s brother, Samuel Lynde, was to own many more, working them in his lucrative silk factory in Old Saybrook. Nathaniel’s father was Simon Lynde (1624-1687), an aristocratically connected land speculator of Boston who, as a boy, had been presented to King Charles I, grantor of the first license to transport slaves from Guinea. Simon owned not only “ffour Negroes”, as described in his will, but a ship, the “Endevor”, which sailed on at least one occasion carrying kidnapped Maine and Nova Scotia Indians into slavery in the Azores. Simon also had business interests in Barbados, specifically with the Drax family of sugar planters, whose mansions and fortunes were built through slave labor. Nathaniel Lynde’s wife was Susannah Willoughby, daughter of Francis Willoughby, Deputy Governor of Massachusetts, and his wife Margaret Locke Taylor, a wealthy young widow Willoughby had married in London. Though Willoughby invested in the sort of ships that made the journey between New England and the West Indies, I have found no evidence that he owned slaves. But Margaret’s third and last husband, Capt. Lawrence Hammond of Charlestown, certainly did. Hammond was engaged in the Triangle Trade in which slaves, sugar and rum oscillated to the benefit of merchants and slave traders alike. At first glance, I thought having slaves in her house may have been a strange experience for Margaret, born in an England in which black slaves were something one only heard about from relatives who lived in the West Indies. I knew the Lockes were a family whose wealth had been made via trade with Europe, a fortune created by the turbulent times, and attendant opportunities, in which they lived. Margaret’s great-grandfather, Sir William Locke, Sheriff of London, had been mercer to King Henry VIII and Queen Anne Boleyn. So friendly were king and merchant that Henry came to dine at the Locke home in Cheapside. 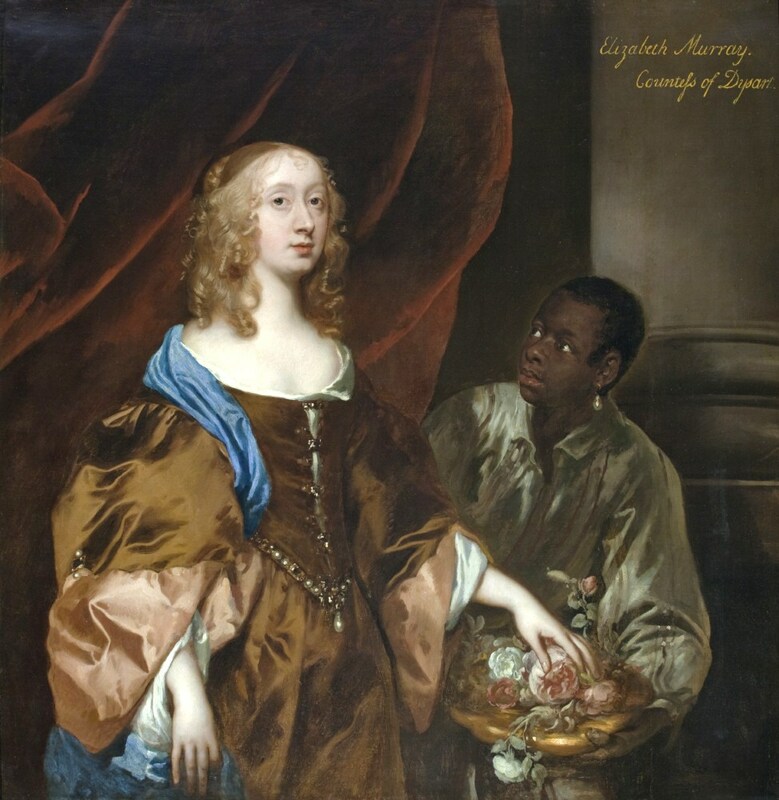 Though Henry’s first wife, Catherine of Aragon, brought slaves of African origin with her to England, from what I could tell, slavery was not among the investments in the Lockes’ portfolio. By almost as many wives as the king, Sir William sired an army of interesting children. One of them, merchant Thomas Locke, imprisoned for Protestant heresy in the reign of radical Catholic Queen Mary Tudor, was Margaret Willoughby’s great-grandfather. His son, Matthew Locke, married Margaret Allen, child of Sir William Allen, former Lord Mayor of London, whose public mistreatment at the hands of three ungrateful daughters is thought by some scholars to be an inspiration for Shakespeare’s King Lear. With all this drama crowding the stage, keeping track of Thomas’s siblings had not been among my interests. Then one of them took me by surprise. A few weeks ago, while reading Steven M. Wise’s book Though the Heavens May Fall: The Landmark Trial That Led to the End of Human Slavery, the name of one John Lok, merchant, caught my eye. In 1555, Lok brought what are believed to be the first African slaves to London. These were five Ghanaian men whom Lok carried off in his trading ship from the west coast of Africa, men who shared space on board with those other commodities of quick cash, ivory, gold and spices. The spelling of the surname was different, but I checked my Locke genealogical files anyway to see whether this man could have been one of Sir William’s relatives. John Lok turned out to be more than just a relative—he was one of Sir William Locke’s sons. Furthermore, Margaret Locke’s great-grandfather Thomas, a half-brother of John, was also on that voyage to Africa, and had served as an investor in his brother’s venture. I now realized that enslaved Africans have been a part of my white ancestors’ lives not just since the reign of Charles II, but from that of Mary Tudor, over a century earlier than what I had thought to be the limit of slavery in my colonial American ancestry. Slaves in the house were probably not all that strange after all in the world of Margaret Locke Taylor Willoughby Hammond. After the Revolutionary War, my Connecticut Yankee ancestors transferred to the Deep South, where slavery was to hold out longest on American soil. (One cousin evidently thought the peculiar institution would last forever: he brought his fifty slaves to Texas just before the Civil War that parted him from them forever.) In fact my connection to this legacy of slavery, Clarissa Bushnell, married a man who, according to family tradition, was killed by robbers while transporting slaves from Virginia to Tennessee. Yet it is Clarissa, my fifth great-grandmother, who brings us to the man who ended that legacy for my particular branch of the family. In spring 1862, a young southern husband and father took the very great risk of leaving his wife, newborn daughter and everything he had worked for in his new state of Arkansas to cross to the Union side of the Civil War and fight for an end to the slavery that was part of his own family’s legacy. He survived his decision, but sickness picked up in camp left him an invalid, and he died ten years later in his mid-forties. The Union soldier’s name was Samuel Selathiel Mason, and he was my third great-grandfather; the infant daughter he left behind was my great-great-grandmother, and Samuel’s wife, Elizabeth Shewmake, my third great-grandmother, was a granddaughter of Clarissa Bushnell, the link to slavery from the Tudors to the presidency of Abraham Lincoln. Between them, this couple severed their ancestral tie to slavery, and their grandson, my great-grandfather, bent the rules further, risking Klan harassment by welcoming black friends in the front door of his eastern Texas farmhouse. He raised my grandmother to see all people as equal, regardless of color. In turn, she bequeathed this legacy on to her daughter, my mother, and from her to me. As Sandra pointed out, I have a very big house to clean. It’s a house with Tudor foundations, Stuart staircases, Georgian windows and an attic filled with the melancholy glitter of generations of white exploitation of African and Native American people. It is a house, as another perceptive friend of mine wrote me, that is covered with the tangled vines of interwoven relationships and interdependencies, vines that choke the structure yet hold the old house together. I need to trace those vines from roots to farthest tendrils, to find where they lead. And I need to tell the stories of the enslaved who helped make us and our world, who provided buildings and streets and corporations we take for granted, who made history of which we have never heard. You are welcome! There are so many details in this history that need to be explored – especially those faces in the mirror. You are very welcome – thank you! Yes, slavery at one time was legal in all the colonies, later states. However the institution ended earlier state by state in the north. New Jersey was the last northern state to end slavery. The boarder states of Delaware, Maryland, West Virginia, Kentucky, and Missouri did not end slavery until after the civil war when the 13th amendment went into affect. I am fond of the poet Gil Scott-Heron’s refrain: “We are the ones, who tie our fathers to our sons.” Hayter-Menzies’ ability to tease out the Bushnell legacy might show diligence and tenacity. It might also demonstrate that, sometimes a story wants to be told … as if it has its own animus. I wonder whether Western science will some day offer proof of genetic memory, a feature often valued in societies reinforced by oral transmission of culture. As it is, this narrative should fit well into modalities of Western thought: it allows a paper trail of documented fact to give us pause in our beliefs. I look forward to the book. I’m entertained by the author’s deft use of language. Vitally, however, my personal meditations are nourished by its content. I have ancestors rumbling around in my awareness, trying to make personal, influencing statements following my introduction to them by historical accounts I’ve unearthed. This was wonderful to read, Grant, and I hope that you’re able to turn this into a book someday. Thanks so much for this story, Grant. It was fascinating to read. “Cleaning house” is a compelling metaphor, too. Thank you Grant…look forward to a book too!! I truly enjoyed your blog post. I am sure your book will be as interesting. Your story is very moving, and I too look forward to the book. Slavery was the economy of the world; directly or indirectly. Thank you for your courage to bring these stories forward and don’t get caught up in the cobwebs. Looking forward your book as well as many others. Thank you! I’m unrolling it in greater detail and scope now as a book…. not easy, but I’m doing it.